A monument commemorates Captain Arthur Phillip`s and his party`s exploration of the north arm of Broken Bay. 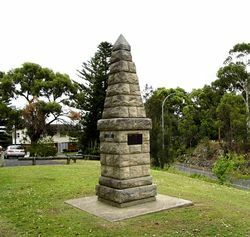 In early March 1788, Governor Arthur Phillip led a small party of officers and marines on an exploratory voyage along the coast to the north of Sydney Harbour. Only five weeks after the arrival of the First Fleet at Sydney Cove, it became clear that reliable supplies of water and food must be found if the settlement was to survive. During the eight-day voyage, Phillip and his party made a brief exploration of both sides of Broken Bay. 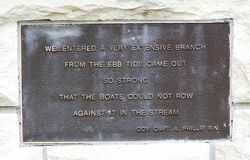 This included a tributary initially known as the `north arm`. Later this area was to be called the `north-east arm`, and eventually `Brisbane Water`. Gov. Capt. A. Phillip R.N. 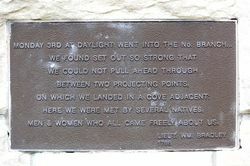 Here we were met by several natives, men & women who all came freely about us.